Gina has over sixteen years of experience working with children and their families. Prior to joining Children’s Health Council, she was the Director of Early Intervention at Pacific Autism Center for Education (PACE) and Area Director for Easter Seals Bay Area – Autism Program. Gina spent much of her time training and empowering parents to support their child’s skill development on all levels. She also trained and supported teams of developmental therapists, behavioral interventionists and teachers to develop successful programs for children on the Autism Spectrum. 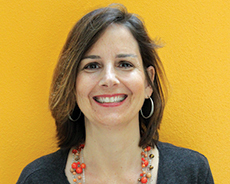 Gina has worked extensively coordinating services with several agencies and organizations in the Bay Area. She was thrilled to join the team at CHC to continue to offer parent training through ESPA. Gina grew up in St. Louis, Missouri and is still debating which baseball team to route for – Giants or Cardinals. When not working, Gina enjoys family, hiking and exploring San Francisco.